Nicole Dahlkemper, DMD (Mt Pleasant) - Book Appointment Online! Your smile is one of the first things people notice. 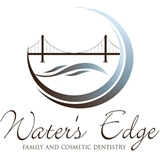 If you want a beautiful healthy smile and exceptional dental health, visit the dental office of Water's Edge Family and Cosmetic Dentistry. This appointment was my first with Dr. Dahlkemper and she, along with her entire staff, made me feel welcomed. Going to the dentist is scary enough and when you have a bad experience things are doomed to go badly -- that's why I am so grateful to of had these great people taking care of me! Very clean, professional and comfortable office/hygiene rooms.